Study the morphological differences in the fungi kingdom and a lichen which shows the symbiotic relationship between fungi and algae. Supplied in separate, labeled jars or vials. 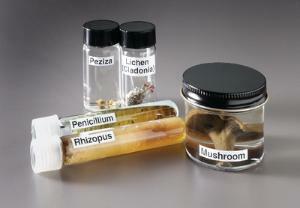 Contents: Zygomycete (Rhizopus) in vial, Basidiomycete (Mushroom) in jar, Ascomycete (Peziza) in vial, Deuteromycete (Penicillium) in vial, Mycophycophyte (Lichen) in vial. Set of five.